Fall is not here yet…but is is coming! 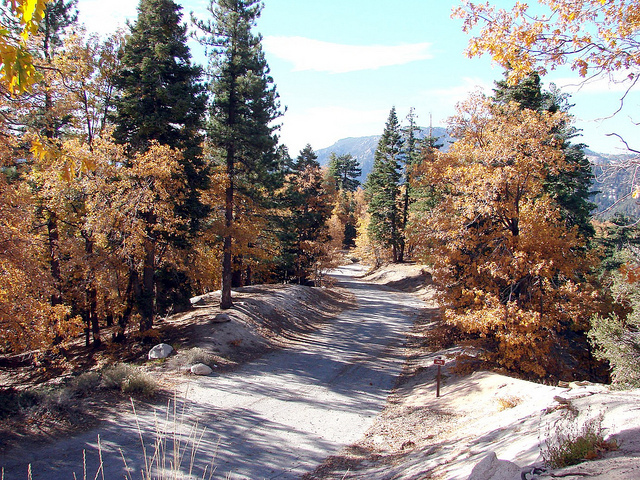 Any of you who are regulars at Big Bear Lake know that this place changes with each season. Spring, summer, fall, and winter all showcase a different facet of the area, which gives you a reason to come up and visit us 365 days a year. Labor Day not only gives those who have been working hard all year a well-deserved day off, but it indicates the passing of the torch from swimming and playing in the lake to fishing on the shore and crunching through leaves on the trails. It looks like the person controlling the weather has already received the message. Welcome to the Party, Fall! How close is fall? The Big Bear Convention Center will be hosting their annual Fall Fest Arts and Crafts Show. The local crafters and artists will be demonstrating how they make their special pieces, as well as selling and displaying their work through Sunday. While you are there, you can start preparing for Oktoberfest, another annual tradition held at the Convention Center. The fun itself starts on September 14, but tickets are on sale now. This is an incredible yearly event you don’t want to miss. Humans are not the only ones getting ready for cooler temperatures and shorter days. The animals at the Big Bear Alpine Zoo are getting ready as well. They will be putting on new coats and getting ready for the colder weather coming, and you can come and support it at their Ice Cream Safari on Saturday, August 31. There will be five stations with a scoop of ice cream each through the zoo, inviting you to tour and learn all about the animals they have saved. If you want to see the animals of Big Bear Lake in their native environment, The Big Bear Discovery Center will have a full battery of events for you to explore, from panning for gold to kayak tours to guided nature walks. Get out and explore nature with the family one last time this summer! Some of you out there are less animal lover and more party animal. It has been a summer full of music here at Big Bear Lake. Along with all of the live bands that are going to be at Nottingham’s, Black Diamond Tavern, B’s Boathouse, and all the other local haunts, there will be a few concerts here over Labor Day weekend. Gary Seiler and the Coast Riders, covering your favorite Jimmy Buffet songs, will be part of the Music in the Mountains tour on August 31. The Cave, kicking off its opening season with a bang, will have Strangelove, a Depeche Mode tribute band, and Blue Order, a New Order tribute band to finish it off. We don’t worry because summer is coming to an end; we get excited for all of the opportunities fall is going to bring! The International Film Festival is right around the corner, more outdoor endurance events, and Troutfest are all autumn events that will be here quicker than you know. Make sure you have your reservations for your favorite events now, since we have been busy all summer and rooms here go quickly. What fall events are your favorites? Let us know on our Facebook page or in our Twitter feed! Have a great week, and we will see you around the lake. Gallery | This entry was posted in The Seasons, What to see and do and tagged Adventure, Autumn, Big Bear CA, Big Bear Discovery Center, Big Bear Film Festival, big bear lake, events, Fall, Fall Fest, family, Fishing Tournament, fun, holiday events, holidays in Big Bear, lake, mountain, music, nature, Oktoberfest, Snow Summit, summer, The Cave, travel, vacation, weather, What to Do. Bookmark the permalink.